Most dedicated listeners but also more casual fans of classical music have at some point wondered about the sound of early musical instruments once played by the great composers. The question of how historic instruments might have sounded veritably haunted Russian pianist Anton Rubinstein, who lamented that while some instruments that had survived in museums they had long lost their original colour and tone. The result was that nobody really knew any longer which techniques had been used in their production, or what their exact sound was like. That knowledge and experience had been lost. Hearing music from the classical period performed on the modern piano requires the understanding that through the centuries something was forgotten. Mozart composed for the modern piano’s predecessor, the fortepiano, which later came to be regarded as obsolete. It was only in the second half of the 20th century that a serious interest in Early Music and historic instruments was revived. 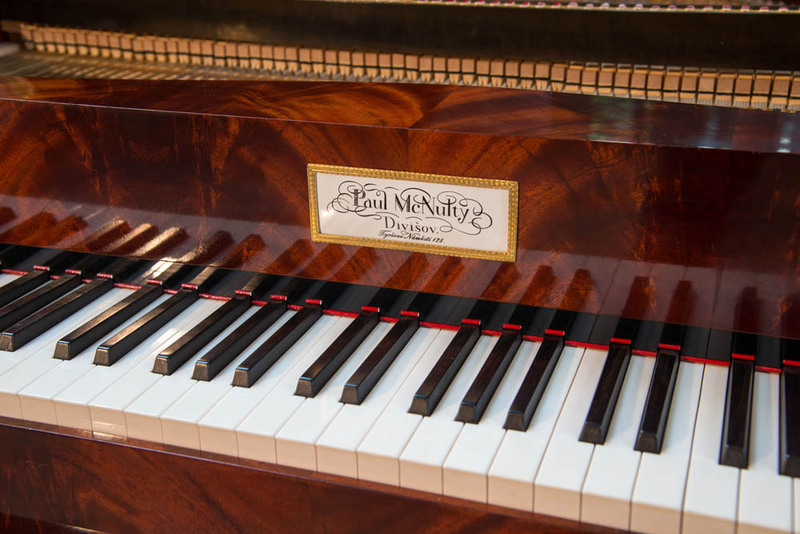 One who had an interest in Early Music was American-born fortepiano builder Paul McNulty; in the 1980s, he was attracted to historic designs including keyboards by Viennese maker Anton Walter, who had built pianos for Wolfgang Amadeus Mozart. It became his life’s work. Not long ago, I met with Paul at his workshop and home in the village of Divišov, south of Prague, where he and his wife, the acclaimed fortepianist Viviana Sofronitsky, run McNulty Fortepianos, building clones of historic pianos with the utmost precision. Building an historic instrument, approximating the sound of early instruments, is the one of the most important goals for both. Originally, McNulty trained to be a guitarist, but things turned out differently. Paul McNulty: “I think I was the hardest-working music student at Peabody Conservatory for a couple of years! But in my second year my teacher said ‘Gee, Paul, I don’t know about your senior recital…’ And that was my last lesson because the writing seemed to be on the wall. I went from that to a very brief career as a graveyard-shift parking lot attendant where I read a lot of books including the great Studs Terkel book ‘Working’”, in which the happiest guy was the piano tuner. It was apparent early on that McNulty had the knack for the construction of early period instruments whose secrets had largely been forgotten. He was particularly interested in a Anton Walter fortepiano other builders had been trying to ‘resurrect’. At the time information was scant. “In 1979 there was this drawing that was freely available of this five-octave Anton Walter – Mozart’s piano maker. Most people who were attempting these things in 1980 were using that drawing. The unfortunate thing about that drawing is that it leave many things unregistered: the thickness of the soundboard in particular. “I encountered a fellow in Amsterdam who in 1985 had a Walter open and then closed it up. And I asked him about the soundboard thickness and he said it was ‘normal.’ I personally got to take apart a Walter in 2000 and to make all my own measurements to literally reproduce them. Of course, achieving authenticity is only ever an estimate but if the sound is gratifying and complex qualities of the instrument emerge, it is clear one is on the right track. Paul McNulty again: “It is only as enough studies of the antique instruments emerged that anyone could begin getting close to getting a satisfying sound. They explored the range of colours, the particular characteristics and this is something that emerges in the quality of the writing. Here is how McNulty describes the sound of the Viennese fortepianos. For the builder and also for the performer recapturing the past is part of the adventure. Stanley Hoogland is a Professor Emeritus at the Conservatories in the Hague and Amsterdam and a specialist in the fortepiano. On a line from Amsterdam, he described for me both the beauty and complexity of playing historic replicas. “In one way, the instrument plays a little lighter and easier, technically speaking, but also involves more precision in your fingers and hands. In one way it is easier, but the precision is more important. Also, an additional action is needed to create sound on the fortepiano, this is something that has to be studied and learned. Building a single fortepiano is nothing if not time-consuming: the treatment of wood alone has to be long planned out, with boards, for example, being left outside for five years before the drying process begins, long before wood is ever laid out and shaped in a workshop. One single piano requires around 1,000 man-hours to make and when he got his start in the Netherlands, McNulty made his instruments on his own. After he moved to the Czech Republic, he continued production in the workshop he created on the grounds of an old ‘statek’ – historically an enclosed property common in South Bohemia and the Czech-Moravia highlands. But the piano maker was by no means ‘cut off’, and eventually among his clients he was sought out by Russian-Canadian pianist Viviana Sofronitsky. Viviana describes the instrument she wanted. They have been together ever since. Currently, McNulty is on schedule to produce 14 new pianos, complete with high-quality metalwork commissioned out. That’s just one year. 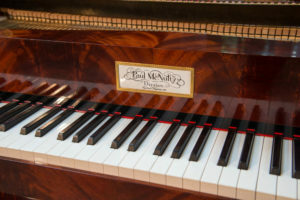 A single fortepiano costs around one million crowns and McNulty focuses on five models or so, including the Walter already mentioned, a Graf, a Pleyel which was used by Chopin and a Boisselot which was owned by Franz Liszt. According to Viviana Sofronitsky, the aim is not to get rich but to be able to provide instruments for those wanting to perform. “Our goal is something different. The mission is to present beautiful music to people. Of course we need money, but it is to continue doing what we do. To pave the way for beautiful music, not to produce money. If money was the only aim, I hope that I would be practical enough to make it some other way.